These are my coworkers Dejah Shea and Ladawna Fry, doing this thing they do absent mindedly sometimes. 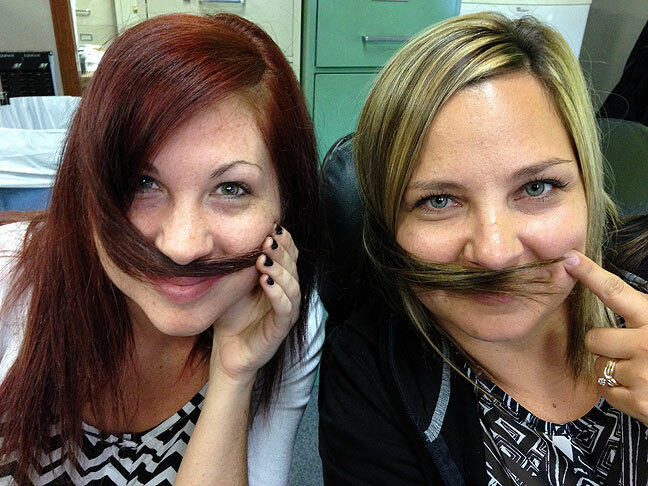 When I see them doing it, I call it “mustaching.” Like a lot of my coworkers, I consider them my friends. I’ve won lots of awards over the years. Sometimes I think members of my profession have award-winning events and images thrust before them all the time. 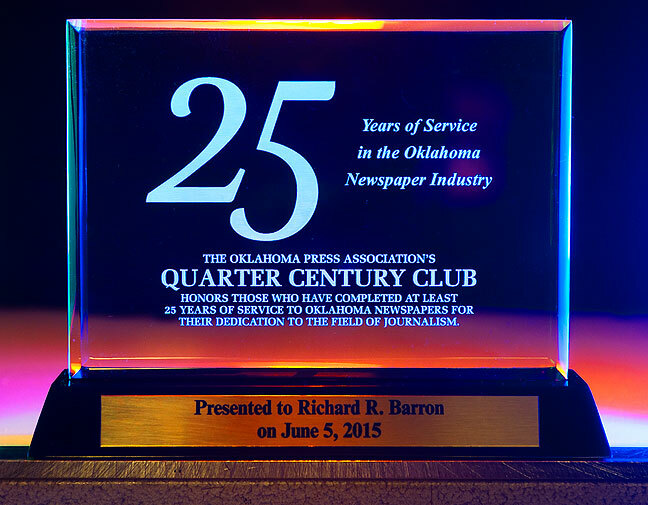 My most recent award was one for just showing up, the Oklahoma Press Association’s Quarter Century Club award, given for 25 years of service at OPA members newspapers, presented to me in the middle of my 27th year in Ada. I started working at the Shawnee News-Star in 1985, so I’ve been in their system for 30 years, but they gave me this acknowledgment as soon as I applied for it. A co-worker, Sports Editor Jeff Cali, got the same award, and posted it to his Facebook wall with the simple epithet, “Man I’m old.” I don’t believe it for a minute. I think both Jeff and I are still young enough and good enough to cover our beats for at least another 25 years. Quarter Century Club award; for the photographically interested, I shot this award using three colored lights angled to pick up the frosted lettering in the back of the glass. Very, very cool, and congratulations. I dunno about 25 MORE years lol. May go crazy before then. Love the lighting in the award photo. In the light and pressure of many forces you have become one of your own.